One June day in the year 793, men in ships landed on Lindisfarne, an island off eastern England occupied by a monastery. The men, apparently from the north, plundered treasures, overthrew altars and set fire to buildings. They killed some monks and carried others off in chains; others, they stripped naked and left behind to the mercies of the weather. The attack shocked European Christian society. They came to mark it as the official start of the Viking Age, when Norse raiders ranged as far as the southern Mediterranean and northern Asia, before seemingly fading out some 250 years later. In fact, the Vikings’ rise was not a sudden event, but part of a long continuum of human development in northern Scandinavia, whose long, intricate marine coasts and archipelagos led to the rise of a culture based on land, but heavily dependent on the sea. The Vikings (the name derives from the Norse for “bay dwellers”) were survivors of a harsh, cold environment, where climatic conditions constantly hovered on the edge of survivability, and small changes in weather could have big effects. So could changes in sea level. What influenced their brief florescence and decline, and how did they make a living over the long term? Today, their experiences may provide an object lesson in how changing climate can affect a civilization. 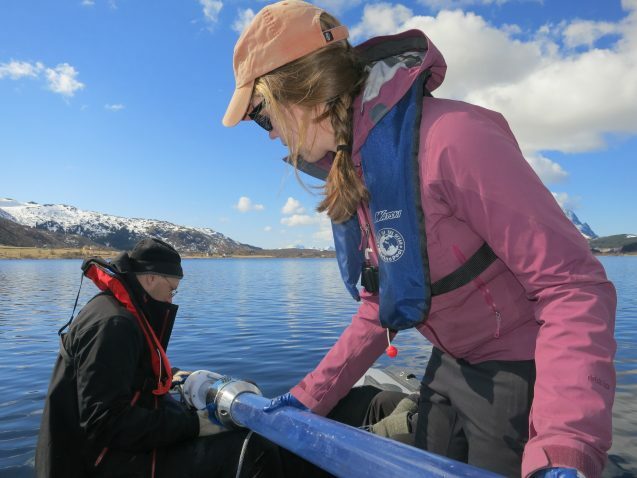 Scientists are plumbing the bottoms of lakes and bays in Norway’s arctic Lofoten Islands to investigate the influence of shifting climate and sea level on the Vikings. Climatologist William D’Andrea of Lamont-Doherty Earth Observatory hauls up a float that has been moored below the surface of a bay for several years. 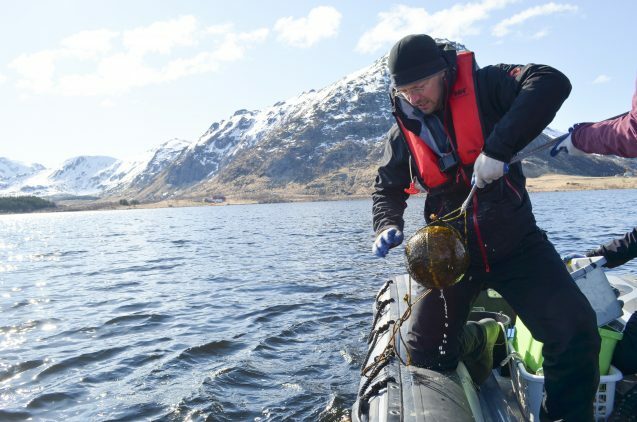 Around key Viking archaeological sites, researchers from Columbia University’s Lamont-Doherty Earth Observatory and other institutions are plumbing the bottoms of deep lakes for clues to how the Vikings and their predecessors adapted, from their early times, around 500 BC, to 1000 AD, peak of the classic pillage-and-plunder period. 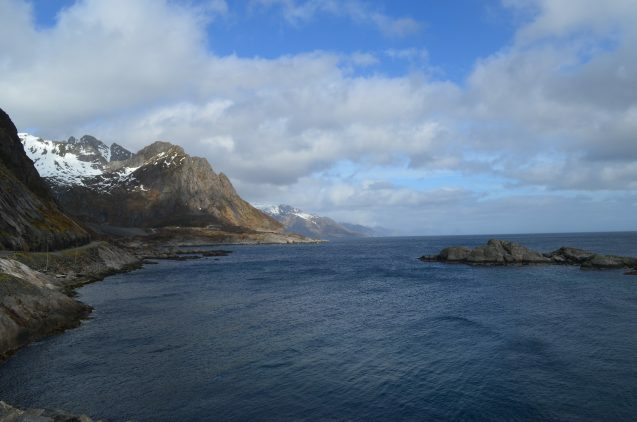 Their study area is in the Lofoten Islands, a remote archipelago off Norway’s coast within the Arctic Circle. People have probably lived amid the Lofotens’ windswept fjords and snowcapped mountains for at least 10,000 years, but they took up conventional civilization late. Rudimentary farming, livestock raising and the use of iron did not start until about 500 BC, millennia after most of the rest of the world. The probable reason: weather. The Lofotens are about the farthest north agriculture has ever gotten. The only reason it is possible here at all is an offshoot of the Atlantic Ocean’s Gulf Stream current, which bathes the islands with just enough warmth from the south to create a short growing season. Even so, conditions are barely tolerable, and minor natural drops in temperature could wipe out crops and livestock. People had to adapt or die. Indeed, previous research has produced evidence of several such climate swings, along with substantial changes in sea level around the islands. The researchers hypothesize that when they could, the Vikings produced as much off the land as they could, but when that did not work, they turned to more dependable harvests from the sea, especially the cod that today still make the Lofotens a major export fishery. No wonder people here became exquisitely skilled shipbuilders and navigators. Did bouts of bad weather and a general shortage of arable land encourage them to go raiding other people’s coastal real estate? Some of the original settlers of Iceland, who crossed the North Atlantic in the late 800s, came from the Lofotens; could similar forces have helped drive them? 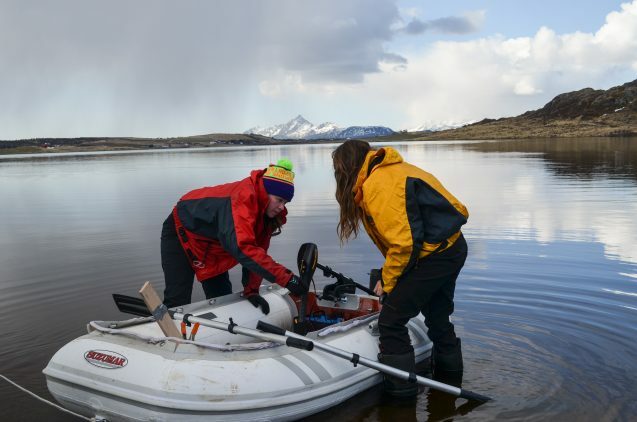 Lamont grad student Lorelei Curtin and Eve Pugsley, a student at the College of William & Mary, launch into a lake that the team plans to sample. The team’s most recent research trip began this past May on a promontory high above Borgpollen, a big inland bay nestled inside Vestvagoya. Hilly farmland slopes down to the bay, which is connected to the ocean by a series of shallow passages. In the chilly dusk of late evening, D’Andrea pointed out local sights. On a distant rise lay the largely invisible remains of the largest Viking dwelling ever found, a longhouse stretching some 270 feet. From here, a series of powerful chieftans ruled about 1,000 years ago, until an apparent sudden decline. Along the bay’s shores lie the ruins of at least 22 stone-and-turf boathouses, where sleek seagoing vessels were once stored and repaired. The longhouse site is now occupied by the popular Lofotr Viking Museum in the village of Borg, where tourists can view artifacts, watch costumed re-enactors relive scenes from Viking life, and cruise the bay on a replica Viking ship. D’Andrea and his collaborators were probing murkier aspects of the period. Each day, they ventured onto the bay or nearby ponds and lakes in modest inflatable watercraft. From these, they dropped coring tubes to the deep bottoms, filling them with mucky detritus washed in century after century from the land. With different materials coming in year by year depending on climate, vegetation and how the land was being used at any one time, the sediments comprise a potential record of humans and their activities going back thousands of years. Mud from lake bottoms holds telltale chemical remnants of the past. Top: D’Andrea and Curtin prepare a core tube, which will be dropped to the bottom and pounded in. Bottom: Hauling up a core is cold, hard work in water that can be over 100 feet deep. At the first lake, they are driven off by giant ice floes left over from winter; wind is pushing the ice around, and they can’t get to the spot they want. The following day, D’Andrea and three students launch their little boat into another lake, ringed with stark mountains and, in the lower elevations, farm fields. This one is fully thawed, but a cold, hard wind is blowing, and the tippy little craft is barely big enough for a couple of people to move around in. They set three anchors to keep the boat in place, then drop a weighted six-foot-long plastic tube attached to a rope overboard until they feel it hit bottom about 75 feet down. D’Andrea and Moussa Dia, a geology student at the College of William & Mary, then take turns yanking on a separate rope rigged to a hammer that drives the corer into the mud. This is strenuous exercise, and it takes a while. When it feels like the core isn’t going in anymore, it is time to retrieve it–another struggle, first to dislodge it from the deep mud, then to haul it back to the surface. When the core tube finally emerges, Dia and D’Andrea hastily cap its bottom so the mud doesn’t fall back out, and wrestle it back into the boat. By now, an inch or more of near-freezing lake water is sloshing around deck. It’s time to return to shore, prepare the core for storage–then go back out for another one. Curtin (top) and William & Mary student Moussa Dia (bottom) with retrieved cores. Sediments washed in from land have a story to tell: a history of temperature swings, vegetation changes and occupation by people and livestock. Previous researchers have already compiled evidence from pollen and other sources suggesting that people here endured several significant ups and downs of temperature during the 1,500-year study period. Now, using newer analytic techniques, the team hopes to get at further information. Waxy substances produced by the leaves of different plants and trees should reveal what was growing at any one time, and whether the landscape was predominantly forest or grassland. 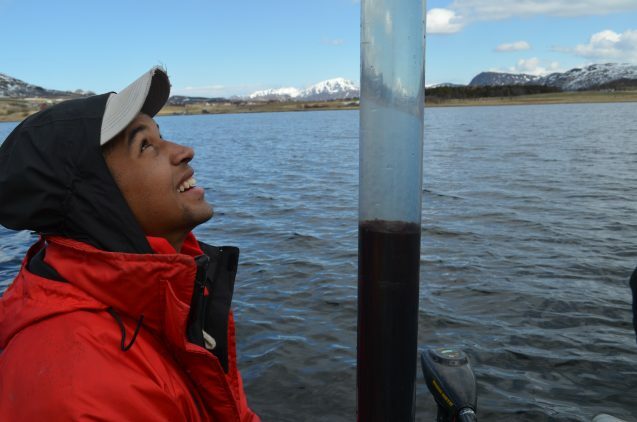 Different forms of lipids produced by lake algae can chart changing water temperatures to within a degree Centigrade. Pyrolytic polycyclic aromatic hydrocarbons–in plain language, soot–can be used to reconstruct the prevalence of fire, and whether the probable sources were natural or manmade. 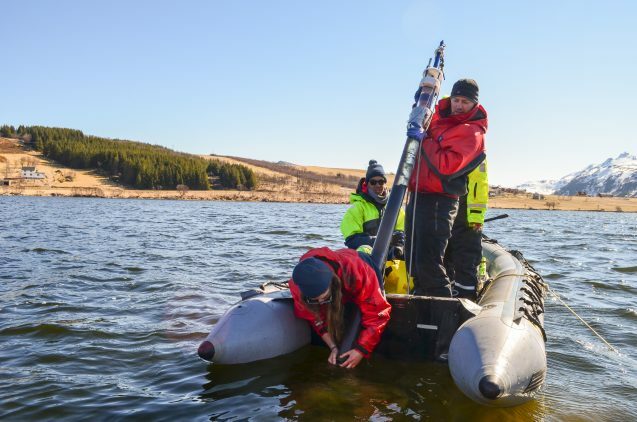 And, very important, poop: distinct compounds produced in the guts of mammals including sheep, cattle and humans and collected in the lake bottom should allow the team to sort out which species were here at which times, and in what numbers. 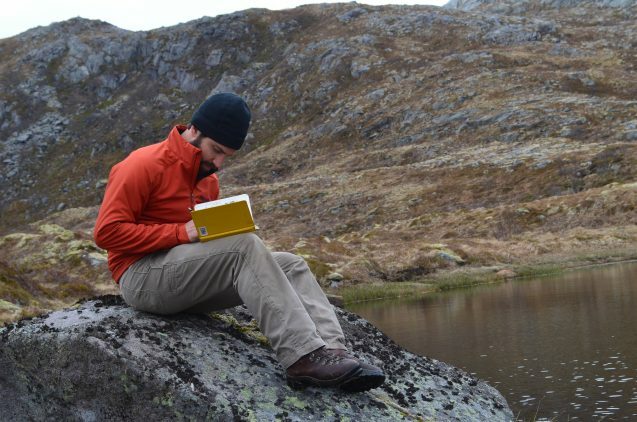 Project co-leader Nicholas Balascio of the College of William & Mary takes notes at small pond near the seashore. Open sea off the eastern shore of the island of Flakstadoya. One separate fact is already clear: people here were affected not only by weather, but changes in sea level. For millennia after the waning of the last ice age, about 15,000 years ago, global sea levels rose as ice melted. But it was the opposite in the Lofotens; the islands were covered with so much ice, the earth was pressed down, and when it melted, the land sprang back, often outpacing the waters’ rise. The process continued through early Viking times, when sea level was three feet more or higher than it is now. It appears that some time after 900 AD, the rising of the land started making Borgpollen’s narrow channel to the ocean too shallow for large ships to pass. The old boathouses now lie stranded and useless, far up from previous beach lines. This local event does not explain the overall decline of Viking raiders, but is perhaps one reason why this particular domain withered. Elsewhere, larger forces were probably at work, including the spreading power of Christian churches and kings who reined in violent freelance chieftans, and converted the cod fishery into a highly organized industrial-scale enterprise as early as the 1200s. On the second full day of fieldwork, the team took to Borgpollen itself, launching from near a couple of replica Viking craft bobbing along a stone pier. Only a few tourists were in sight; it was still early in the season. Far out in the middle, they dropped the corer 150 feet before hitting bottom, and began pounding. After a long interval of taking turns, it seemed they were not making any more progress, and they fought to dislodge it. After a long haul, it came up completely full. Everyone cheered. “That’s probably about 5,000 years’ worth of mud,” said D’Andrea. 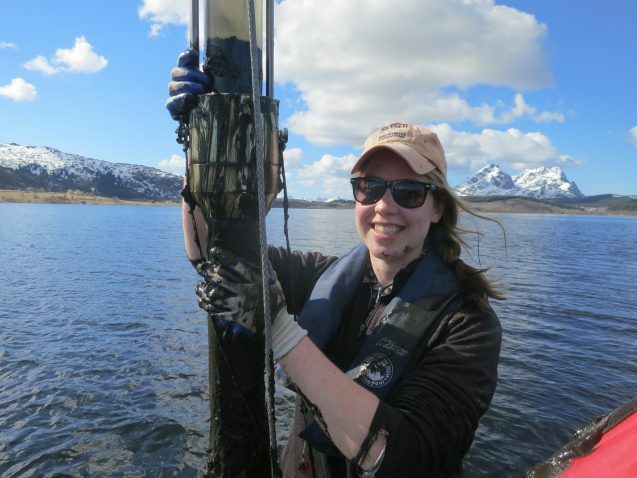 Lamont grad student Lorelei Curtin corralled the apparatus out of the water and capped it. In the process, she was smeared with icy water and sulfurous mud. “OK, I don’t want to go overboard for this,” she half-joked, as the boat tipped sternward while they brought the core aboard. 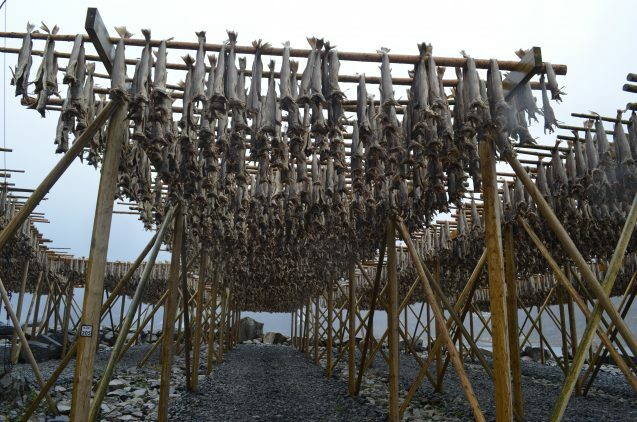 Cod, drying on racks in the fishing village of Sund, were probably a staple for early islanders, and remain so for modern residents. On following days, the team cored a half-dozen more sites, often with the help of Stephen Wickler, an archaeologist at the Tromso University Museum who also had helped organize the work. 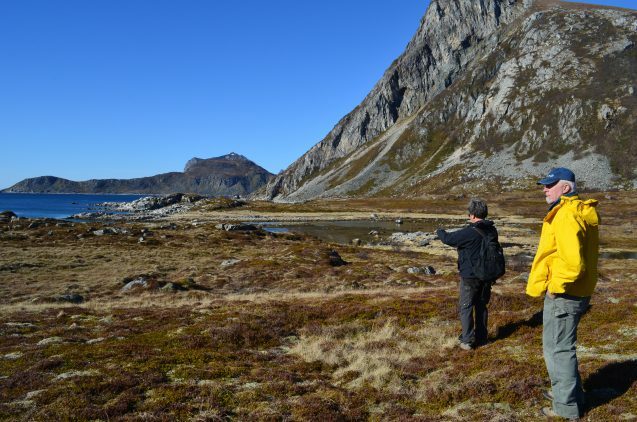 Wickler’s main task, though, would come later; he has done Viking-era excavations all over the far north, and plans to help interpret the cores in light of still largely untapped data from numerous sites. Wickler is also interested in the more distant past. One day, he guided the team to a rocky seaside cove ringed by a flat area set some 30 vertical feet above the tide line. A dozen unobtrusive pits pocked the flat area–the remains of Stone Age dwellings built by people who lived here some 6,000 years ago, he explained. The dwellings were once right on the beach, he said–a marker of how far the island has risen over that time. People were adapting to sea-level change long before the Vikings. Now, he noted, with human-influenced global warming, the sea is almost certain to rise back up again, though how much, no one knows. The Vikings never left the islands. 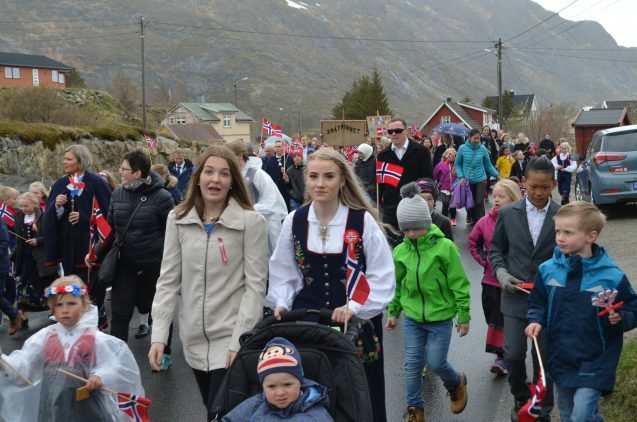 In the village of Sorvagen, many people who are probably their descendants march in the yearly May 17 parade, marking Norway’s independence. They are joined by many new immigrants from Asia, Africa and the Mideast. Climate change could have both good and bad effects here, said Wickler. With cod fishing still a major pursuit, the islands are dotted with fishing villages sitting at water’s edge, just as the Stone Age dwellings once did. If the waters rise even a little, these could be swamped. Moreover, as the ocean warms, the cod appear to be moving their haunts northward, and this could eventually move them out of range. On the other hand: expensive brand-new bridges and tunnels now connect the Lofotens to the mainland and to each other, making them far more accessible to outsiders. Vestvagoya has an airport with a half dozen or more flights each day. That is largely why tourism is booming here, and nudging out fishing as the major industry–at least in warm weather. “If summers get longer and warmer, you can’t see it as necessarily a negative here,” said Wickler. In other words, invaders might now be coming here from the south, and they might in fact be welcome.